Several depressions on the side of a rock. The steep sided massif of Jebel Gule rises some 1,000 feet out of the Blue Nile plain, and has a circumference of some five miles. The Seligman's visited this location during their 1910 expedition to make investigations into physical anthropology as well as aracheology. Manual catalogue entry (thermofax catalogue copy in folder '27-06 Seligman Slide Collection') - "V.d.2. Jebel Guli rocks showing grooves. 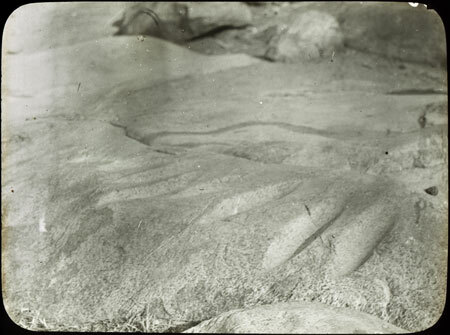 (492)"
Note on lantern slide ms ink - "V.d.2 Sudan Jebel Guli rocks showqing grooves. CGS 492"
Morton, Chris. "Jebel Gule grinding holes" Southern Sudan Project (in development). 03 Jan. 2006. Pitt Rivers Museum. <http://southernsudan.prm.ox.ac.uk/details/1967.26.134/>.